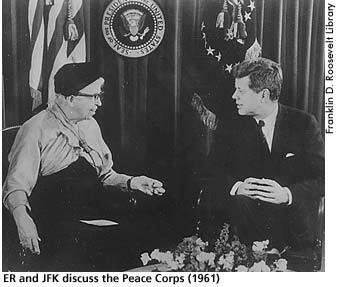 President John F. Kennedy established the Peace Corps by executive order on March 1, 1961. Although they had not always agreed politically, ER had supported the establishment of such an organization since 1957. She applauded JFK's program because she thought the Peace Corps would enable Americans to learn about public service, the duties of citizenship, and the international responsibilities of the United States to less developed countries. Recognizing her enthusiasm, Kennedy appointed Roosevelt to the Peace Corps Advisory Council in 196l. Later that year, Congress passed legislation creating the Peace Corps. The program goals were ambitious: to help the people of interested countries and areas in meeting their needs for trained workers; to help promote a better understanding of Americans on the part of the people served; and to help promote a better understanding of other peoples on the part of Americans. The diversity of specializations within the Peace Corps continued to expand through the 1960s and 1970s as the number of volunteers in the field swelled to more than 15,000. In 1979, President Jimmy Carter granted the Peace Corps full autonomy from the federal government, but in 1982 the number of Peace Corps volunteers dropped to the lowest number in twenty years. The agency responded by offering increasingly attractive benefits to students and young people and, by the early 1990s, the Peace Corps had managed to replenish the number of volunteers in the field. The Peace Corps remains a central aspect of the international development policies of the United States to this day, with over 7,000 volunteers currently deployed in the field or in training. Black, Allida. Casting Her Own Shadow: Eleanor Roosevelt and the Shaping of Postwar Liberalism. New York: Columbia University Press, 1996, 174, 192. Lash, Joseph. Eleanor, The Years Alone. New York: W.W. Norton & Company, 1972, 317. Patterson, James. Grand Expectations: The United States, 1945-1974. New York: Oxford University Press, 1996, 487. Peace Corp. Internet on-line. Available From http://www.peacecorps.gov.